Providing you the best range of colorful decorated dandiya sticks and multicolor decorated dandiya sticks with effective & timely delivery. 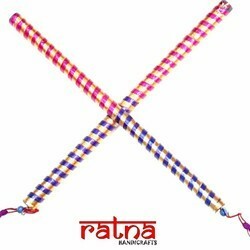 Fancy decorated wooden dandiya sticks with satin cloth draped. The piece is made from strong wood for damdiya raas and other celebrations.